This is a scale replica of an early 20th century combined lighthouse and dwelling located on the Pictou waterfront near the Hector Quay. This type of lighthouse could be found on Caribou Point in 1916 and by the Guysborough Harbour in 1905. The lighthouse is part of a complex that is the new home of the Northumberland Fisheries Museum. 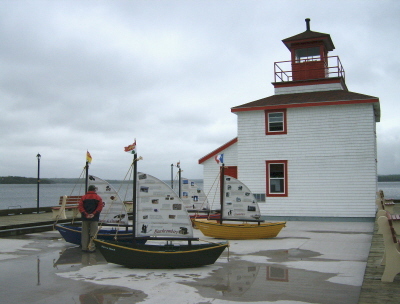 The first floor of the Lighthouse Museum contains the Rip Irwin collection and his animated map of lighthouses of Nova Scotia. The second story has a bedroom and lamp room for visitors to see life in a lighthouse when manned by a lightkeeper. A ladder from the second story leads to the light. Rip E Irwin spent 20 years researching NS lighthouses and amassed a collection of over 18,000 photos, interviews and artifacts. His collection is available for viewing by anyone with an interest in lighthouses. Rip’s 6 foot animated map shows the location of all lighthouses in Nova Scotia with lights flashing according to each lighthouse. Students from the local NS Community College will eventually add New Brunswick and Prince Edward Island lighthouses to this map. The Lighthouse Museum is open for the summer season from 10am to 6pm Monday to Saturday. Admission includes access to the 3 sites in the Northumberland Fisheries Museum complex.